How’s your work/life balance looking? Although many of us strive to achieve it, improve it, or find it - what does balancing work and life actually mean? Not as much as we think. On closer inspection, it’s a misnomer, a myth, a red herring - an ideal which leads us to believe that our work and home lives occupy two separate and opposing spaces, divided by an invisible line. In reality, the line - if there is one - is hugely blurred. Our wants, hopes, anxieties and fears go where we go. Stress at work is taken home and vice versa. Feeling content, healthy and motivated has a positive effect on our productivity at work and the relationships in our personal lives. According to the Office for National Statistics, the average Briton spent 37.5 hours a week at work last year - over a third of our awake time. Work is a significant part of our lives, so instead of chasing an abstract notion and talking about the balance between ‘work’ and ‘life’, perhaps it’s time to change the conversation. 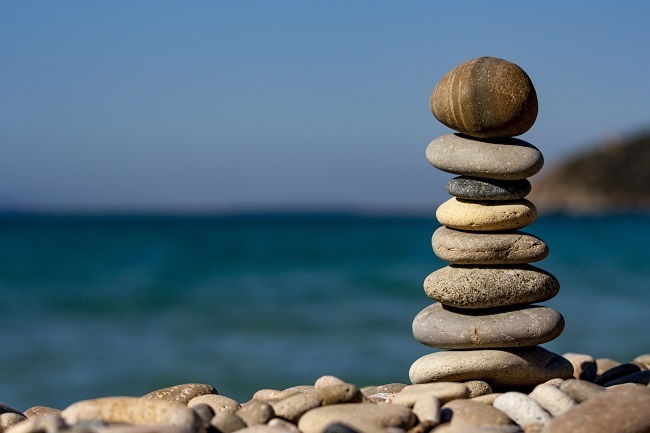 Striving for personal balance and wellbeing offers us a more holistic approach to achieving better productivity and happiness in all aspects of our lives. So how do you do it? We all know the health benefits of eating well and exercising, but what you eat can also impact on your overall happiness and productivity. A study by the British Journal of Health Psychology found that the more fruits and vegetables people consumed, the more happy, creative and engaged they tended to be. Both exercise and nutrients in fresh foods increase the production of dopamine, a chemical which boosts motivation, curiosity and focus. So, if you want to feel your best and achieve optimal productivity, taking simple steps to make healthier food choices can make all the difference. Try eating more fresh, colourful foods and reducing the amount of stodgy carbs in your diet, which can make you feel sluggish and de-energised. It might mean you have fewer sick days too. According to research from the British Journal of Sports Medicine, people who are fit (doing five or more days of exercise per week) are much less likely to develop upper respiratory tract illnesses (colds, coughs and chest infections) than those who do little or no exercise. As a business leader, you shouldn’t underestimate the impact of your mental state, mindset and motivation on the rest of the workforce. But whether it’s work life, home life or anywhere in between, exercise is uncomparable in relieving stress, powering your immune system and improving your overall wellbeing. There was a time when being a great leader was synonymous with being forceful, inflexible and perhaps even ruthless - but those Napoleonic ideals are thankfully a thing of the past. Allowing yourself to be seen as fallible and flawed is key to showing vulnerability, which in turn makes you more open and approachable. As a leader, being open and listening to others without judgement not only allows people the opportunity to be heard: it also establishes relationships built on trust and respect. This, in turn promotes a culture of mutual support, respect and empathy in the workplace as a whole. When people are happier, they are more engaged, receptive and productive. John Helliwell’s World Happiness Report looked at 100,000 workers around the world and found that even a slightly more positive relationship between worker and manager can translate into a substantial increase in overall productivity. The strongest outside influence in our lives is undoubtedly other people; they can inspire and enlighten us, or they can drag us down. As the American entrepreneur Jim Rohn says, ‘you’re the average of the five people you spend the most time with’. So be selective about who those people are. If you’re surrounded by negativity or ambivalence, it’s likely to be catching and can hold you back from your goals and aspirations. So how do you seek out the people who will have a positive effect on your life? A good place to start is core values or principles. Establish what yours are so you can seek out like-minded individuals who share the same values. And be humble. Ditch the ego and actively seek out individuals who you think are better than you in a particular area, and can inspire you to grow and develop. In the professional arena, you can join peer groups or attend networking events for advice and support. But of course, the people in your personal life are just as important. Look closely at the people in your extended family - is there a second cousin or aunt who has experience in your field, or who you simply find engaging and inspirational? Reach out to them and connect. We hear a lot about truth and honesty, but why is it so important for business leaders to be true to themselves? Only by knowing what we really want from life, who we really are and what or who might be holding us back, can we find happiness and reach our full potential. Is it time to leave a toxic relationship? Are you making excuses for why you haven’t done that thing you’ve always wanted to do? What do you really want? Do the other people in your life want the same things? Why have you failed in the past? As they say, the truth hurts, and answering these questions can indeed be difficult and painful. But the truth also provides the foundation for long-term happiness and contentment, so fight for it. Ask the hard questions and be honest with yourself. This will also help you to be honest with others. In the workplace, people respond to truth and transparency - with truth and transparency. As a leader when you speak to people in real, honest language (instead of business speak and platitudes), they are much more likely to hear what you’re saying and reciprocate. This culture of openness and truth makes everyone more human and ultimately, more happy. Being a successful and positive leader all comes down to you. Not your work persona, or the you on your sofa on a Saturday night, just you - how you feel, how you perceive yourself and how you engage with others. So take time to nurture, nourish and listen to yourself. There is no work/life balance: there is just life.